The snow was falling up. I stared out the dining room window until my eyes watered and my breath froze on the glass, sure that my eyes were tricking me. Surely if I looked long enough, I would see that the snow was, in fact, coming down. But the snow, whipped sideways by howling winds, definitely angled up into the sky. Each time I returned to the window to watch the storm by the glow of the windmill-mounted yard light, the snow still appeared to be moving sideways and upwards. How, I asked myself, can the drifts be growing larger if the snow isn’t falling onto the ground? It was the winter of 1978-79, and I was 8 years old. To this day, I long to once again experience the wonder of that glorious winter. 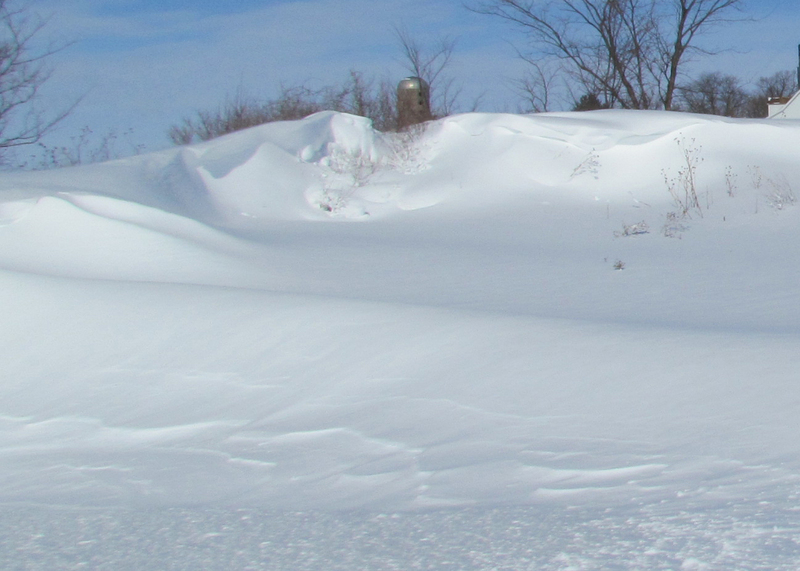 The blizzard that brought the upwards-falling snow left drifts of 6-12 feet deep in our rural driveway and across our gravel road. It was no match for Dad’s John Deere garden tractor-mounted snowblower with the chains on the tires. In many places it was even more than a county snowplow could tackle. It meant I stayed home from school and Dad remained home from work until yellow earthmoving equipment could be brought in to move the mountains of snow. School closed for 10 days that winter. I don’t remember if those days were all in a row or spread out over a few storms. I do remember the anticipation and glee that came from waiting for—and hearing—the words “Kings Consolidated School District 144” on WRHL radio’s school closing list. Oh, the joy I felt upon hearing those words! That was the winter I laid face-up under the delicate lip of the leeward side of a snowdrift, watching a curtain of wind-blown snow crystals skim over the edge. Each gust would build the drift infinitesimally higher, while stray flakes landed on my eyelashes. That was the winter I constructed a sled trail that circumnavigated our farmstead—up and down the drifts, around trees, and along the rim of the icy white canyon that was our road. I propelled myself along the trail by kneeling on a red plastic boat-shaped sled, using my fists and arms like ski poles. That was the winter I dug a snow cave big enough for at least 2 kids to sit in. I was an only child and my best friend lived on the other end of a road the county didn’t plow for weeks, so I sat alone in my quiet cave and dreamed. That was the winter Dad and I played endless games of checkers. (He almost always won.) He, Mom, and I also worked on the puzzles I’d received for Christmas. Mom made hot cocoa—the kind you had to stir each time the cocoa settled to the bottom of your mug. That was the winter I dug myself a seat in the top of a snowdrift one brilliant moonlit night, and watched as millions of glittering snow crystals shifted like tiny dancing diamonds across the landscape. That was the winter of wonder. But I’m still clinging to hope that I can dig another snow cave, and get a mouse-eye view of a snowdrift as it grows. I still gaze at snowy fields on moonlit nights, hoping to see dancing diamonds. I’m still searching for those moments of wonder. This post appeared as the “Stray Kernels” column in the December 2014 issue of DeKalb County Farm Bureau’s Connections magazine.